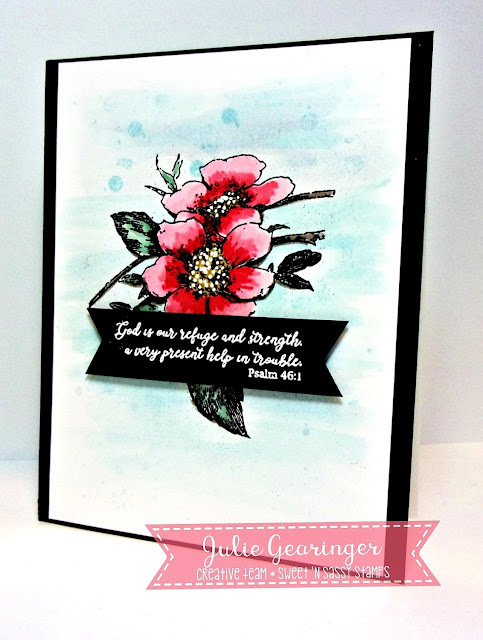 Today I am sharing this card using two stamp sets…Mason Jar Bouquet and Fill Me Up. I needed a card for a friend whose cancer has returned. I wanted to include a couple gift cards so she and her husband could get a good meal or stop for a quick cup of coffee to keep them going on some long trips for treatments. I think these two stamp sets combined pretty well to suit my needs. I hope when she looks at this, she is reminded that lots of people are praying for her. Hello friends, Stephanie here with a quick and easy card using Parisian Post Card, I just love this set. 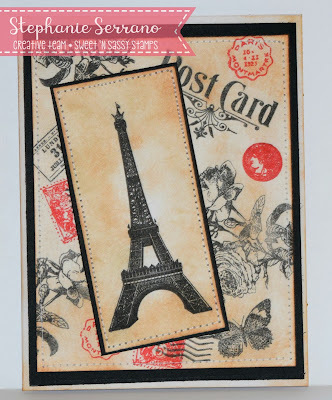 I just stamped away on the background with black and red inks and then did the tower as the focal point. I then did a little distressing with Tim Holtz distress ink. Like I said, quick and easy. 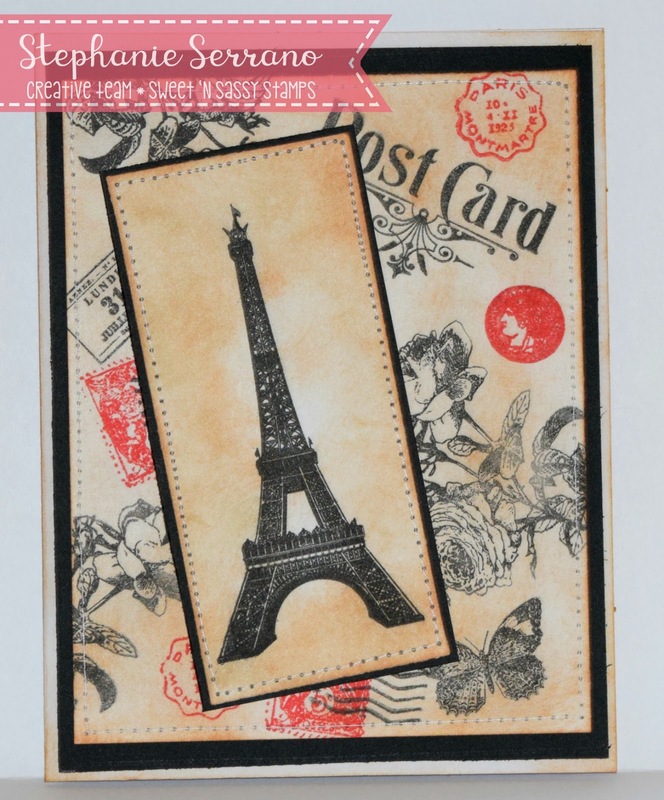 Today I have a card with this month’s release - Creative Worship: Exclamations Clear Stamp Set. 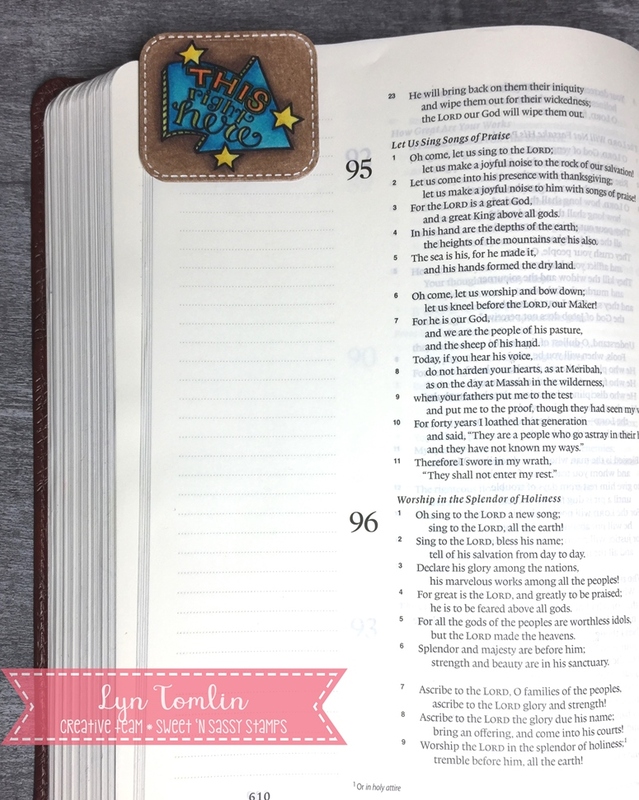 Even though I didn't create a Bible Journal page today, I did think it would be fun to use the arrow image to create a corner bookmark. I wanted to be able to mark a potential journal page. It points right at what I want...I really like it and it was really simple! I dove into my OLD stash for designer paper and used Strathmore Bristol Paper and Polychromos colored pencils. For my set, I am thinking Copics as they are so much quicker for me. Thanks for stopping by. I hope you are inspired! 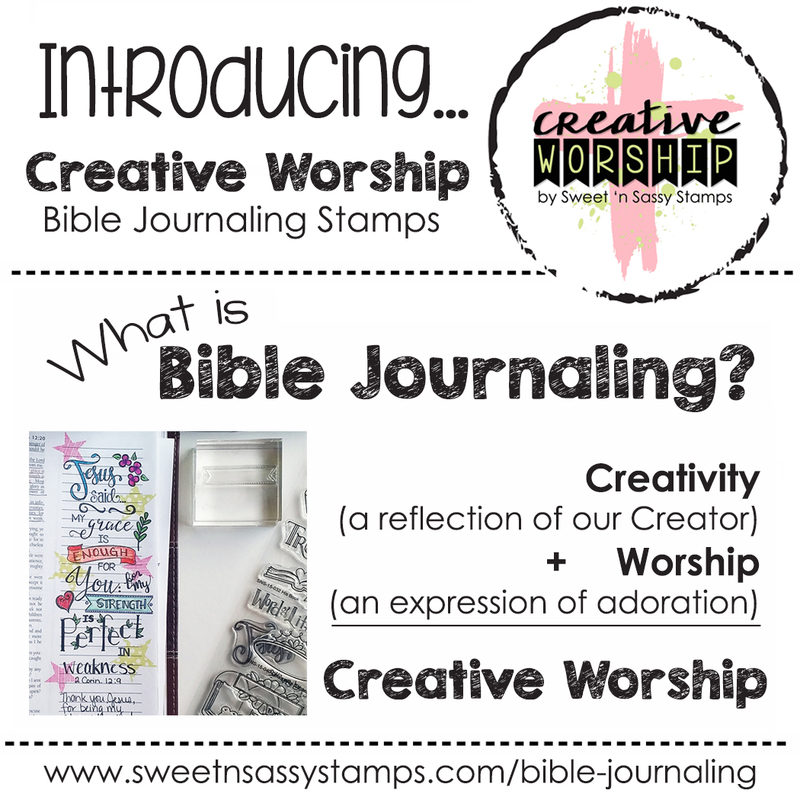 Creative Worship: Exclamations Clear Stamp Set. Hello Sweet Friends! Julie here to share a quick Mixed Media card using Floral Greetings (Graciellie Designs) and Peaceful Peonies Clear Stamp Sets (NinaB Designs)- both available from Sweet ‘n Sassy Stamps. I love how both of these stamp sets offer such beautiful flowers and sentiments- don't you? To create this card- heat emboss the floral image from Floral Greetings with black embossing powder onto white cardstock. Once the embossing has cooled, watercolor the image using water-based markers and tumbled glass distress ink for the watercolor background. Trim the panel and mount onto the black card base. 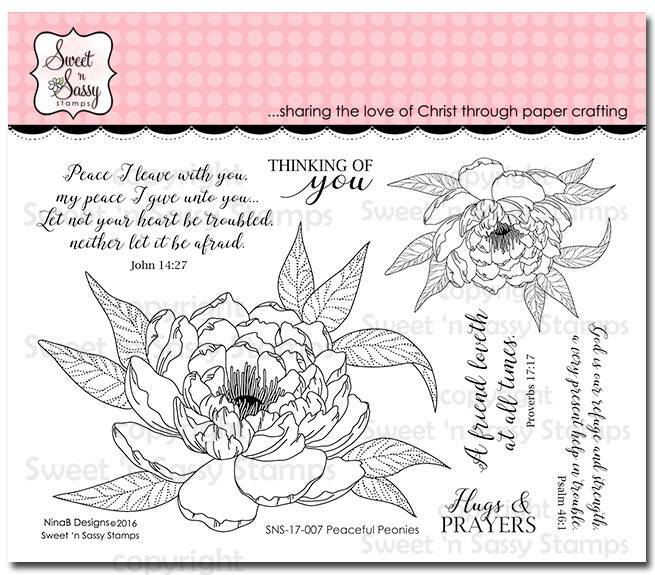 Heat emboss the sentiment from Peaceful Peonies with white embossing powder on black cardstock, create the banner points by hand and mount onto the card front with dimensional foam. 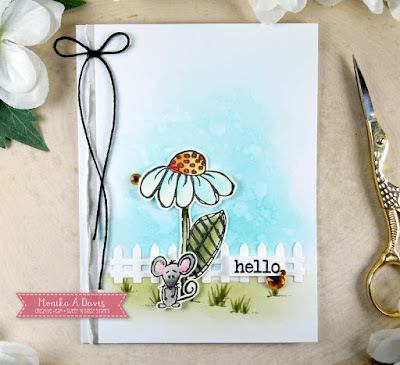 To finish off the card, use a clear glitter pen to add shimmer to the flower petals and a Sharpie® Extra Fine White Paint Pen to add highlights to the flower centers. 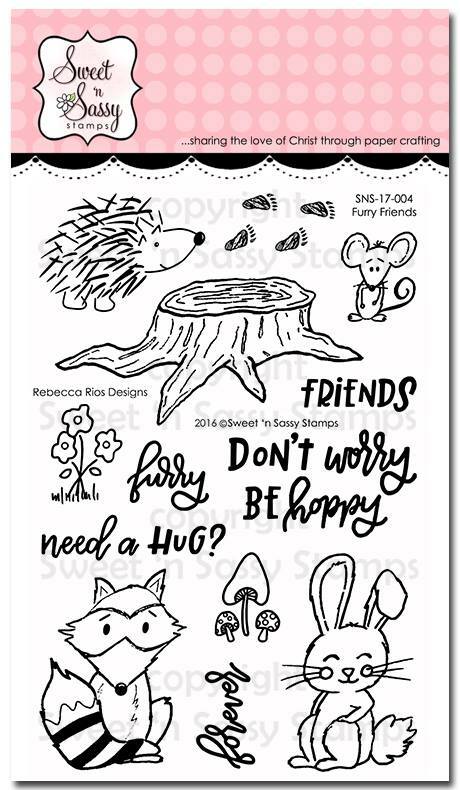 I hope I have inspired you today to get your Sweet ‘n Sassy Stamps out and be creative this week. Thanks for stopping by- have a blessed week, sweet friends! Hello Sweet Friends! It's Monika here today with a CUTE card... I usually make girly cards with flowers, but I love working with CUTE little images from time to time... so today I have a little furry friend (along with a flower)! 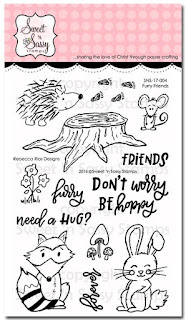 The CUTE little mouse image is from Furry Friends clear stamp set. I stamped the image on water color cardstock, then colored it with Tim Holtz distress inks. 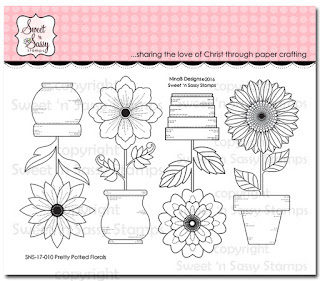 I did the same with the flower image from Scribble Flowers clear stamp set. While I hand cut the flower, there is a coordinating die set available if you don't like cutting or simply want more precise die-cuts. 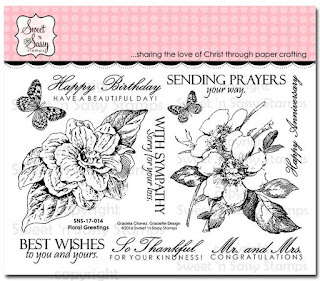 The greeting is from Keep in Touch, Too clear stamp set. It is a must have set with all those different sentiments. The background was sponged with distress inks, then splashed with water... the grass was added with Copic markers. To add more depth to the card, I also added a die-cut fence and a strip of torn silver shimmer paper. Sometimes, it's all about the little details! Hello Sweet 'n Sassy Friends! It's Ceal to share a card with you today. As sat down to make my card my thoughts were on what happened in Manchester, England, 22 lives lost because of a senseless act. Our world needs lots of prayers these days, we need to pray for our leaders and the leaders of our allies. To make my card I started with a top folding white card base and a piece of cold press watercolor paper. I stamped the flowers from the Mason Jar Bouquet set in versamark ink and embossed them in white, masking off the others so I could place one in the middle. I used Daniel Smith watercolors to color them and splattered some across the front to finish the card. Hello Everyone!! It's Sheri Gilson here with a couple Graduation cards to share with you. I'm in complete denial that my baby will be graduating high school next week!! Where did the time go?!?! 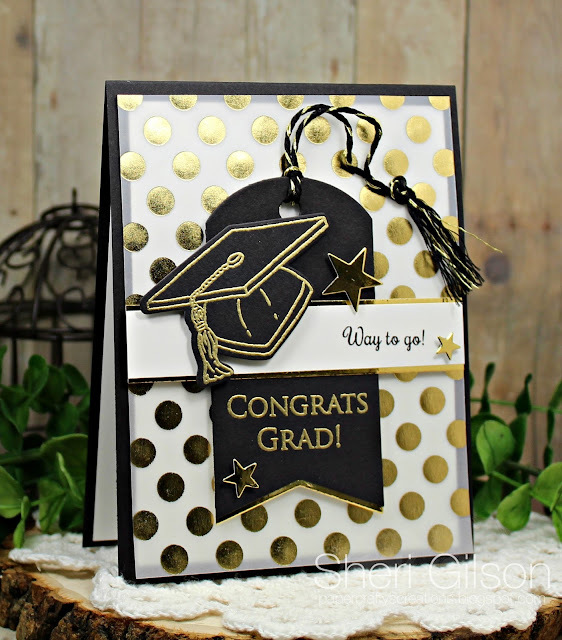 For my cards I used the Congrats Grad Stamp & Die Bundle. 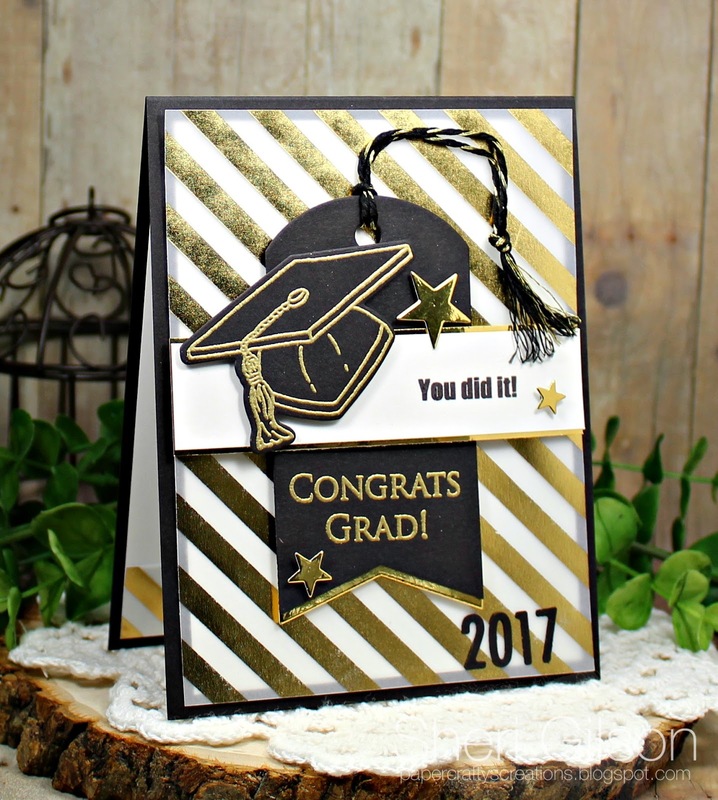 You can also purchase the Congrats Grad stamp set separately. Another option you can find in the store is the Graduation Digital Stamp Set. 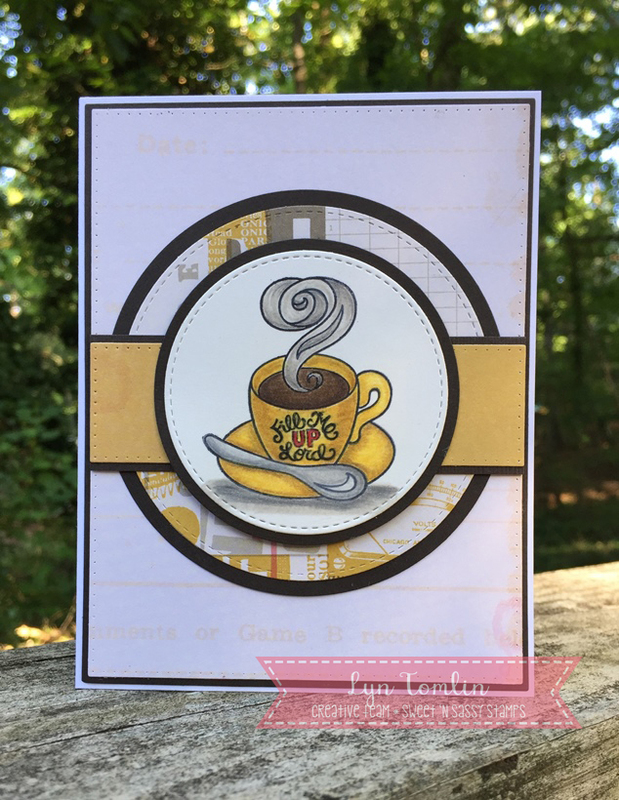 I originally planned to incorporate school colors in the design but then decided to stick with a classic color combo when I found these foiled velum sheets in my stash. 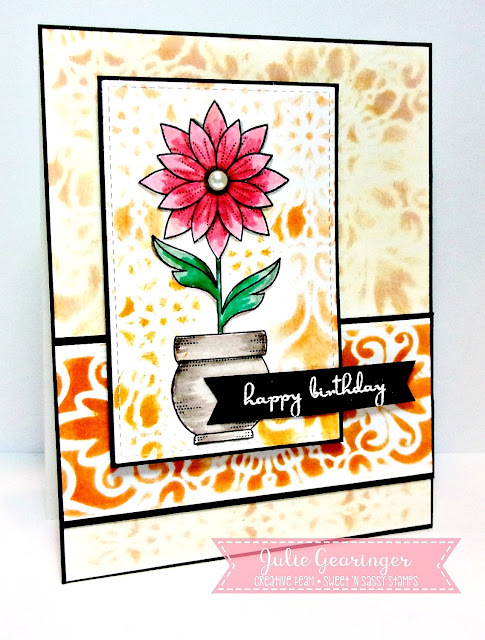 I love to use flowers on my cards so I can't get enough flower stamps ;). So it's no secret that I love the new 'Mason Jar Bouquet' stamp set too. 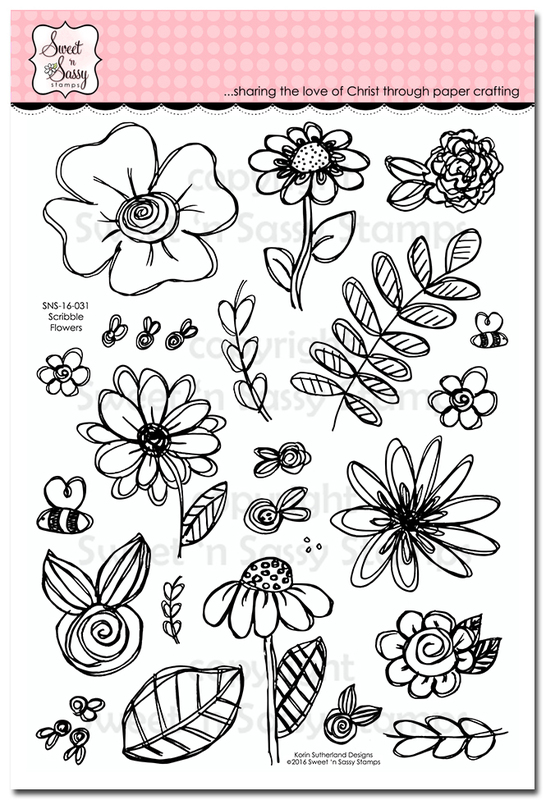 When I saw these beautiful flowers I couldn't wait to start coloring. 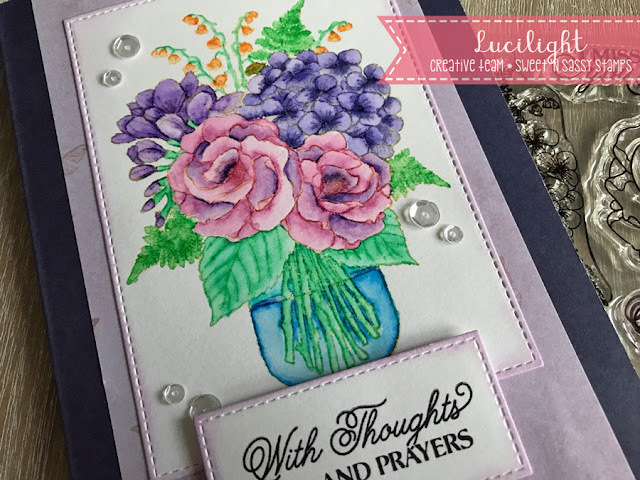 For this card I stamped the image with a very light color of Distress ink on watercolor paper. Because it's a light color the lines are hard to see in the finished image but they give a very subtle idea where the lines should be. I colored the image with watercolor brushes so that made the lines fade out even more. It's a very detailed image and that made the coloring a bit more challenging but it was a lot of fun to do. A good moment to relax a bit after a stressful day ;). When the image was dry I decided to die-cut a panel from the watercolor paper. I die-cut a smaller panel too, so I could stamp the sentiment on a raised panel. 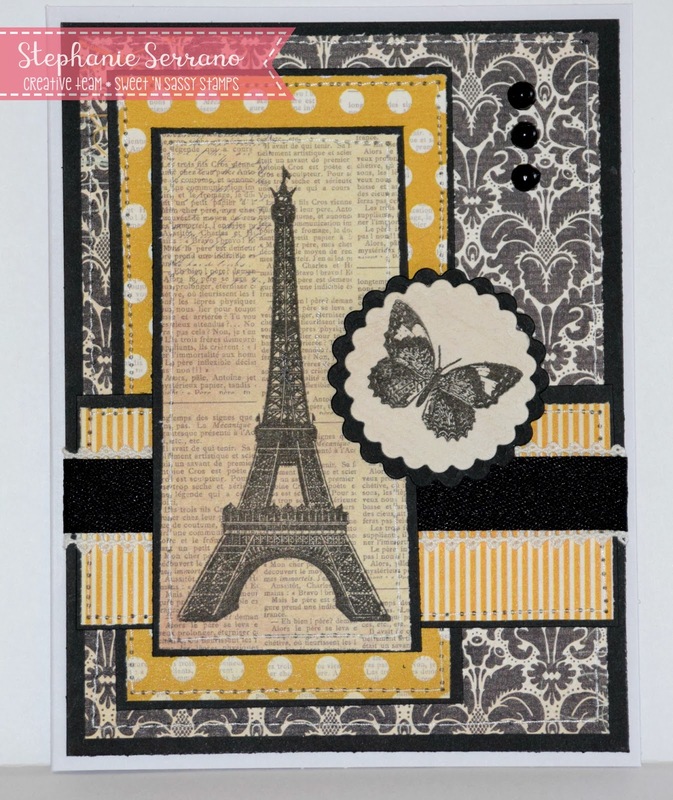 I used a dark card as a base for the card and some purple patterned paper as a background for the panels. I adhered the smaller panel with foam tape and added a couple of sequins as a finishing touch. I used the 'Mason Jar Bouquet' stamp set for this card. Today I am sharing this card using two stamp sets... a new set, Master of the Sea, and an older one called Choose Faith. I kept it pretty CAS and one layer...except the two boats are popped with dimensionals. The words Master and Sea were colored with lighter shades of Copic markers to minimize any bleed-through showing. For the waves, I stamped them with 6 different shades of blues and blue/greens. On the inside I finished my sentiment and added the anchor image to coordinate with the front. 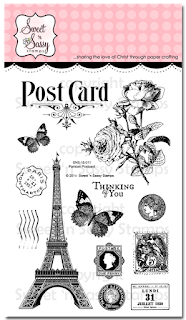 Good morning friends, today I am sharing a card using Parisian Postcard, my granddaughter loves, anything to do with Paris so I just had to have this set. I stamped with Versafine black ink and heat embossed with embossing powder, the paper is from My Minds Eye. Hello sweet friends and Happy Mother's Day! I hope all of the moms out there receive all the pampering you deserve on your special day! 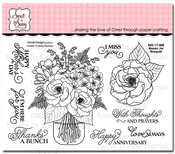 Here are a few bouquets just for you made with the Mason Jar Bouquet stamp set designed by Nina Brackett and available at Sweet 'n Sassy Stamps. After coloring the Jar of flowers with Copic Markers, a frame was cut out of the panel. This created three layers...the first was covered with vellum, the second was popped up with one layer of foam tape, and the third was popped up with two layers of foam tape. The larger flower was colored, cut, and popped onto the outside frame. The sentiment was white embossed on a pennant banner and a metallic thread bow was added. 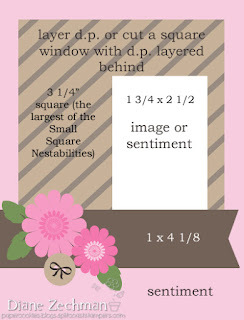 The single flower from Mason Jar Bouquet was stamped randomly on a piece of patterned paper for the background. The mason jar image was colored, cut with a circle die and stitched to the background with a black strip down the left side. The Mother's Day tag was tied to the card with some organdy ribbon. Have a very blessed Mother's Day! Hello Sweet Friends! Julie here to share a Mixed Media birthday card using the Pretty Potted Florals Clear Stamp Set (NinaB Designs) and Long Stem Silhouettes Clear Stamp Set (designed by Korin Sutherland) - both available from Sweet ‘n Sassy Stamps. To create this card- stamp the Pretty Potted Florals image with archival black ink and watercolor with water based markers. Die cut and mount onto black cardstock. 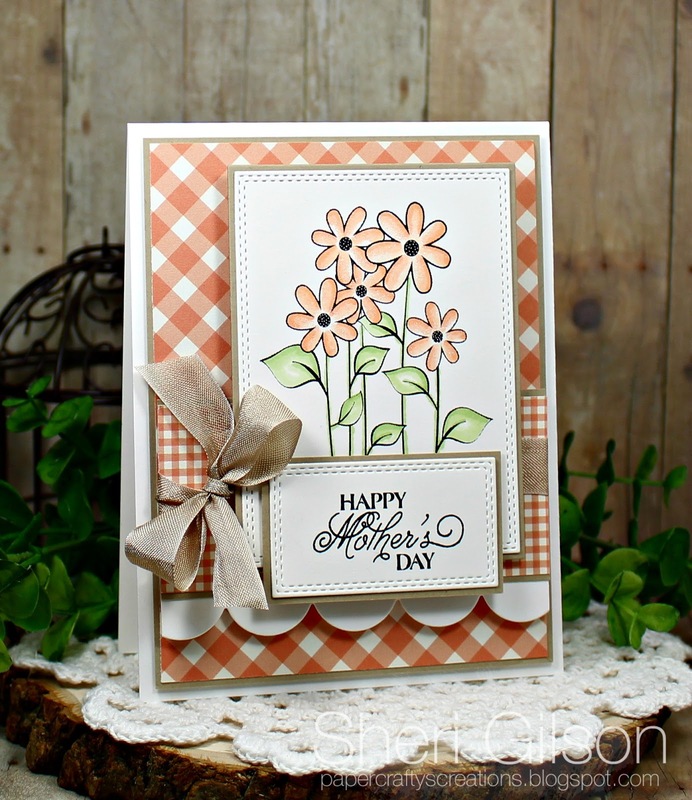 Use a sponge dauber with dijon ink and a flourish stencil for the background, mask the horizontal strip, apply white picket fence distress stain to tone down the background around the masking, score a few lines near the horizontal strip before trimming and mounting onto black cardstock. Mount the background panel and horizontal strip onto black cardstock, mount onto the white card base and add the floral image panel with dimensional foam. 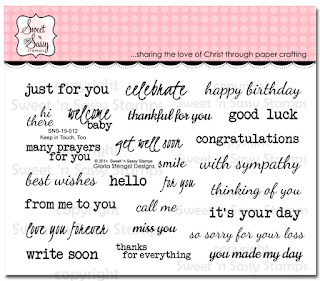 Heat emboss the sentiment from Long Stem Silhouettes with white embossing powder onto black cardstock, create the banner by hand and add to the card front with dimensional foam. 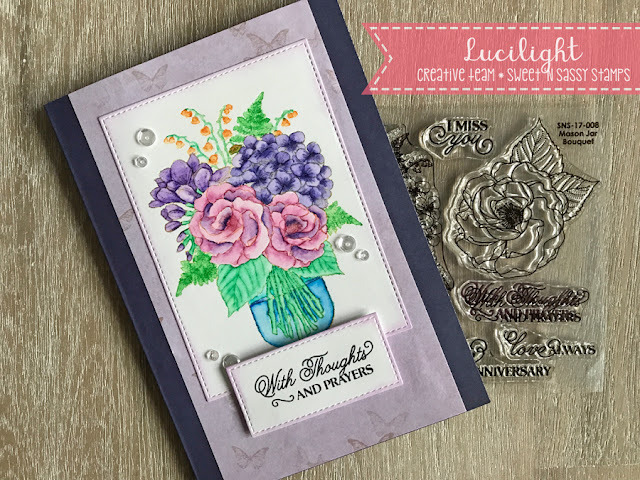 To finish off the card, use a clear glitter pen to add shimmer to the floral petals as well as the background panel and add the pearl to the flower center. Thanks for stopping by- hugs and I hope all of you have a blessed week, sweet friends! Hello Everyone!! 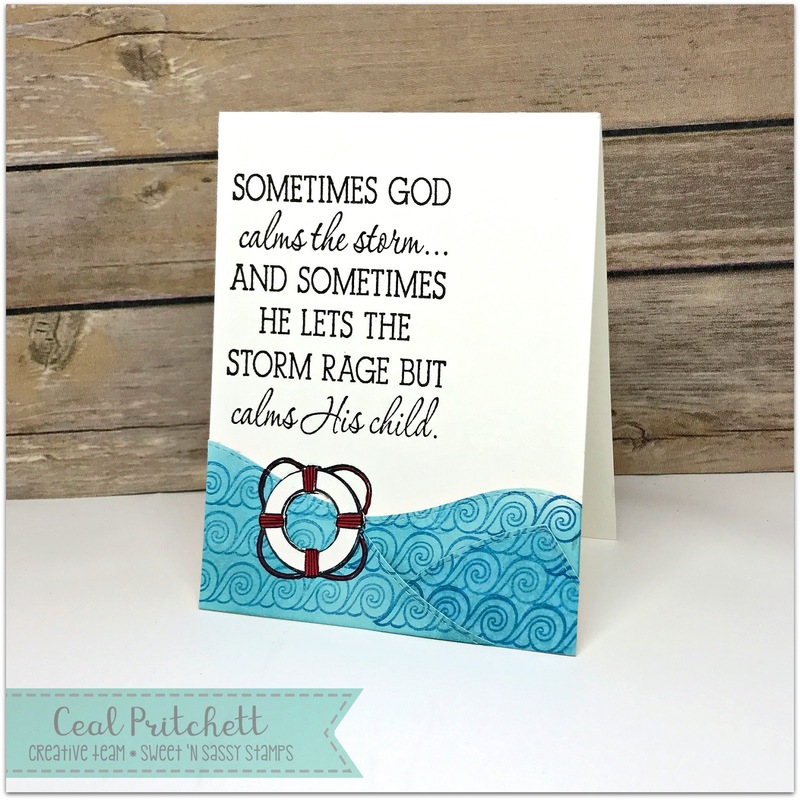 It's Sheri Gilson here with a new card to share with you. I'm super excited to announce that Korin has asked me to extend my stay as a guest designer! Thank you so much, Korin!! With Mother's Day only a couple days away I thought that I would give you a little inspiration of a card I created for my Mom. 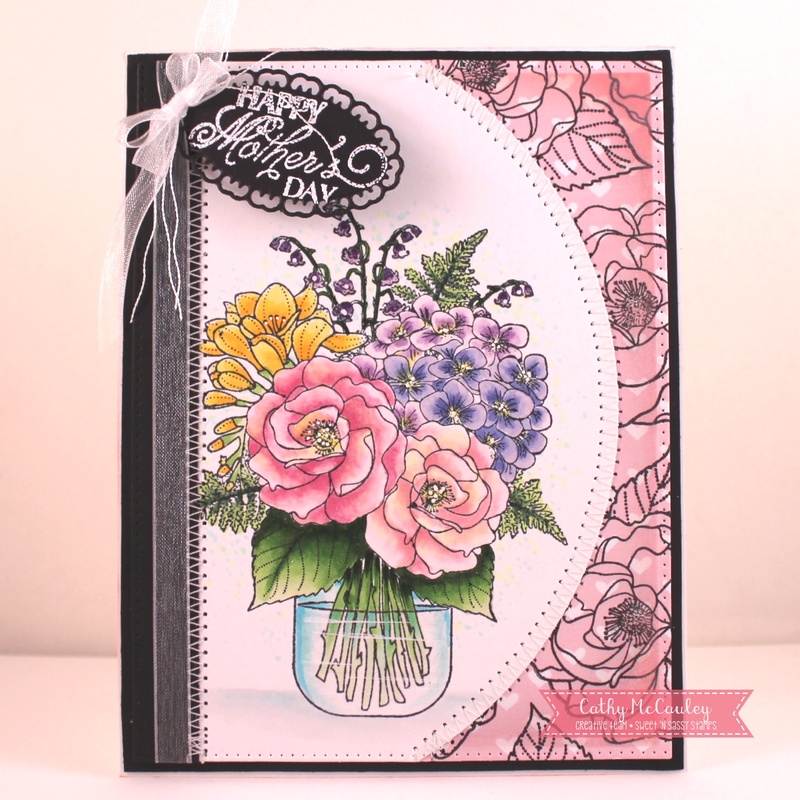 For the main image I used a digital stamp called, Happy Flowers. 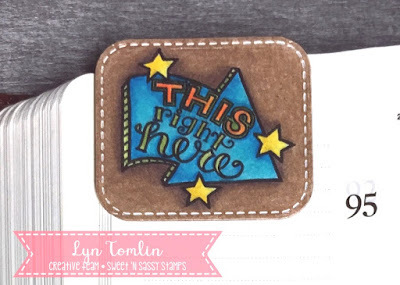 I love using digital stamps as you can purchase them and have them immediately to use. 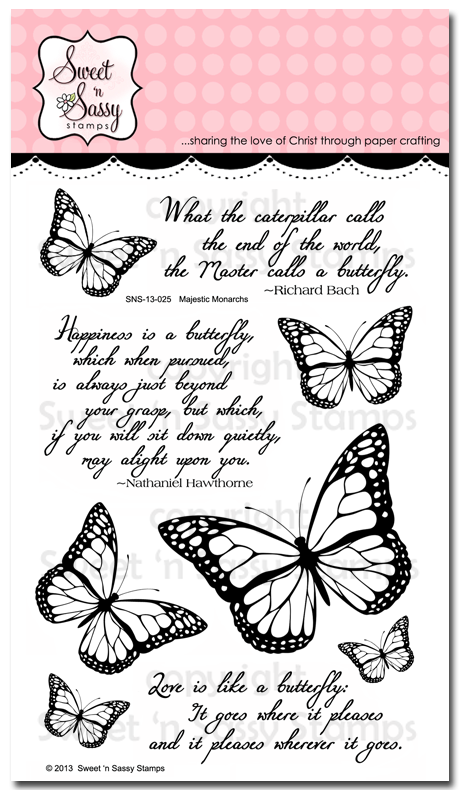 For those of you that like a physical stamp, this image can also be found in the Happy Place stamp set. The Mother's Day sentiment is from the newly released Mason Jar Bouquet. 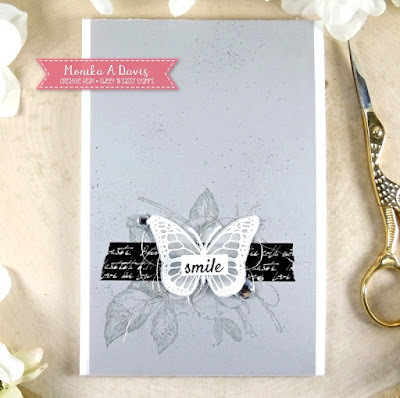 This set is filled with a bunch of sentiments for all types of cards. 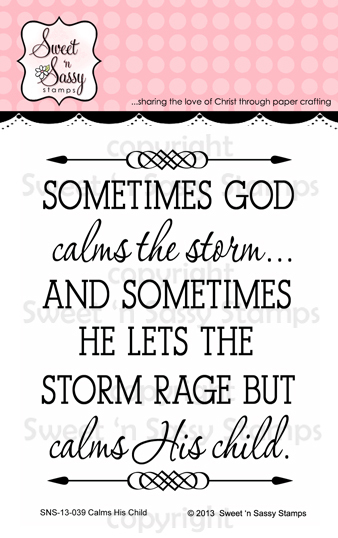 Hi Sweet 'n Sassy friends! 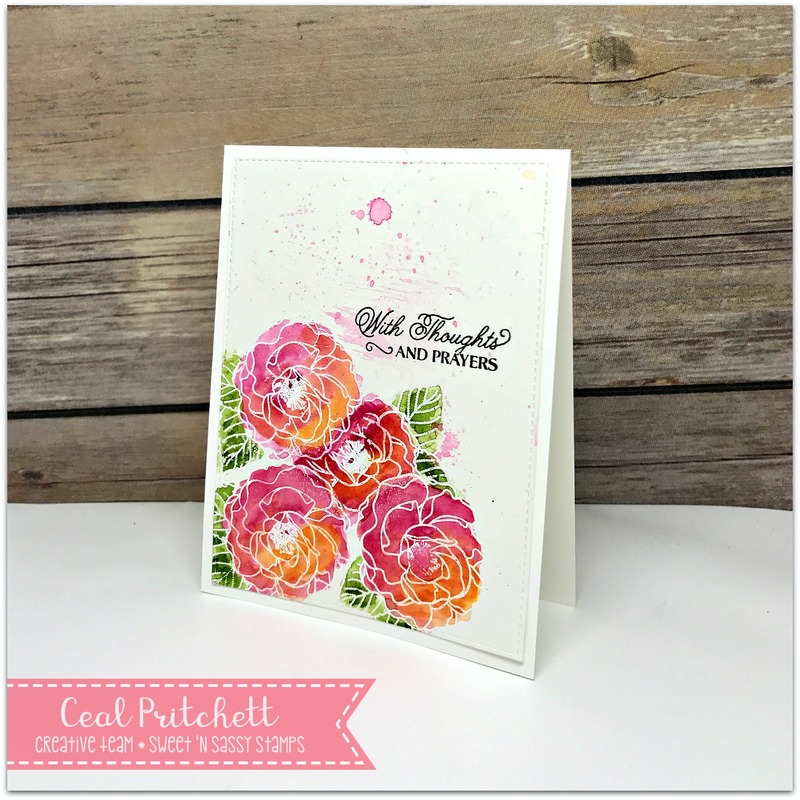 It's Ceal, here to share a card using one of our newest releases paired up with an oldie but goodie. 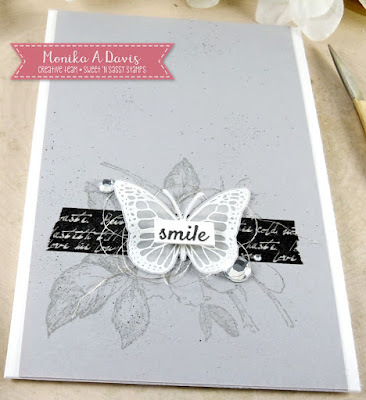 To make my card I started with a top folding white card base and a piece of white cardstock. I sponged the light blue ink over the piece and then stamped the waves from the set Master of the Sea in the darker blue. Next I used a stitched die to cut random pieces for the ocean. I stamped the greeting from Calms His Child in versafine black ink and then wiped off the top and bottom border so there was none. To complete the card I stamped the life ring image and fussy cut it out to add to the front. 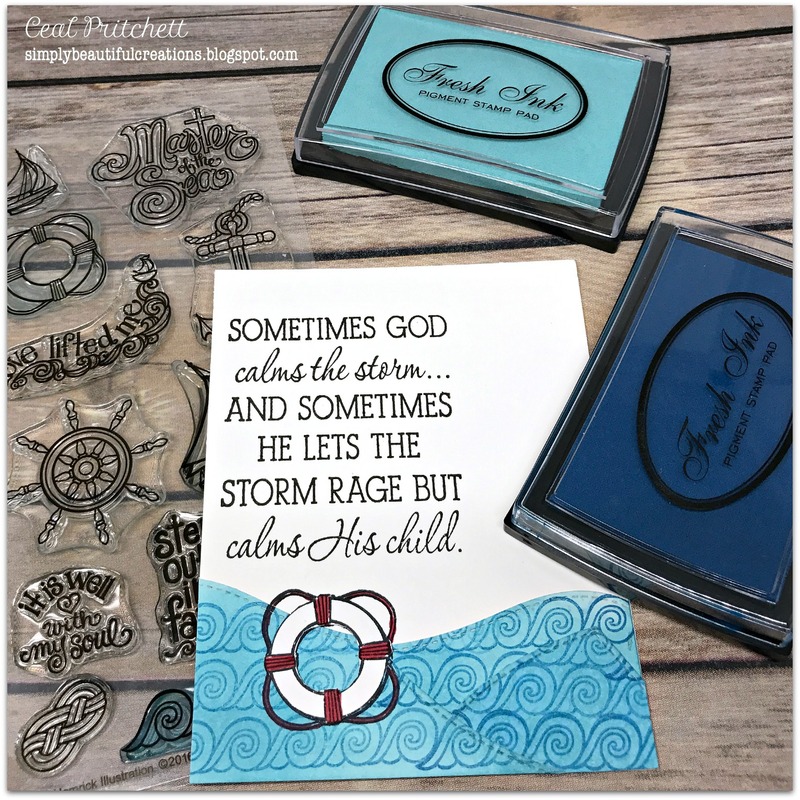 I thought it was fitting to pair these two sets together because the Master of the sea always calms His child. 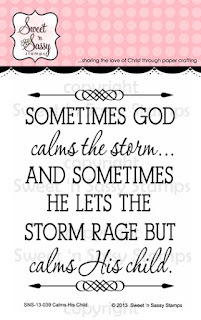 When the storms of life are raging around you, just remember that the wind and the waves still know His name and he will give you rest. This seems to be a popular set, Mason Jar Bouquet, around here lately! And, why not? The flowers just beg to be colored. The design of the main images, lend themselves, with clear crisp lines, to a variety of coloring options! 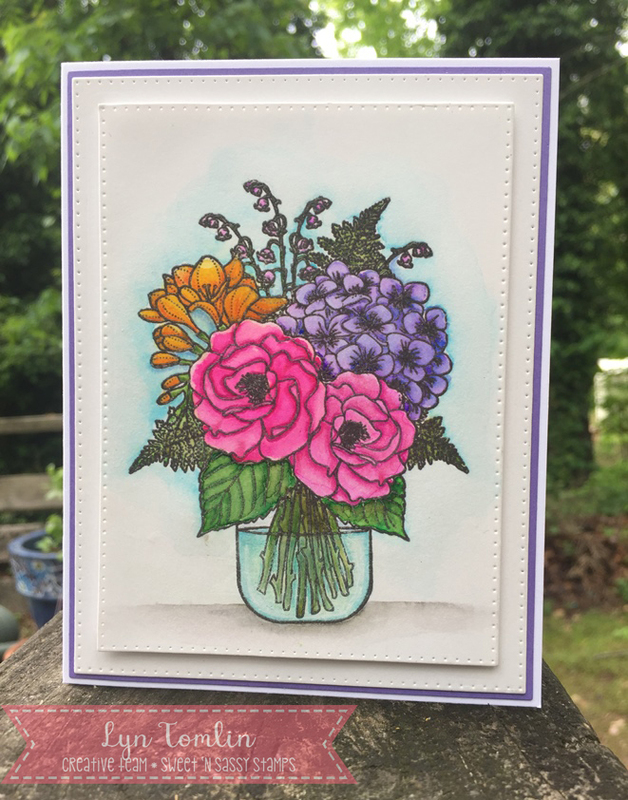 For this one, I did some water coloring with my distress inks, layering different colors to create this beautiful bouquet. 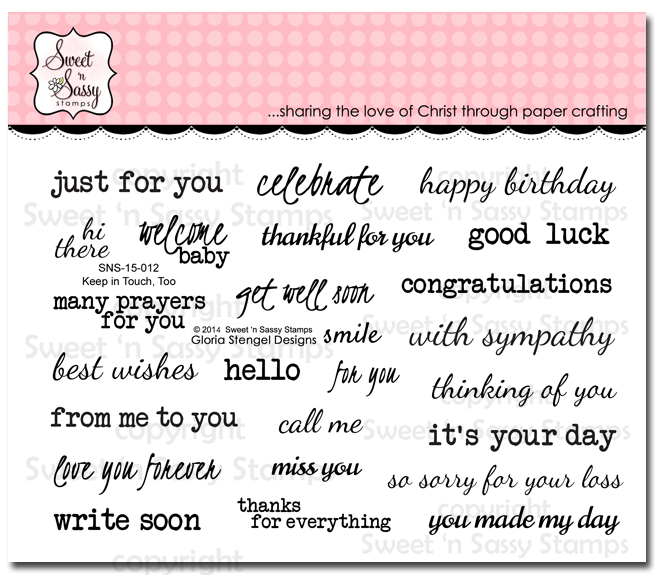 To finish things off, I chose one of the seven sentiments available--I'm all ready to wish my momma a happy day....are you? For today’s card, I went simple and let the image speak for itself and did a little watercolor with my Zig Clean Color Real Brush Pens. 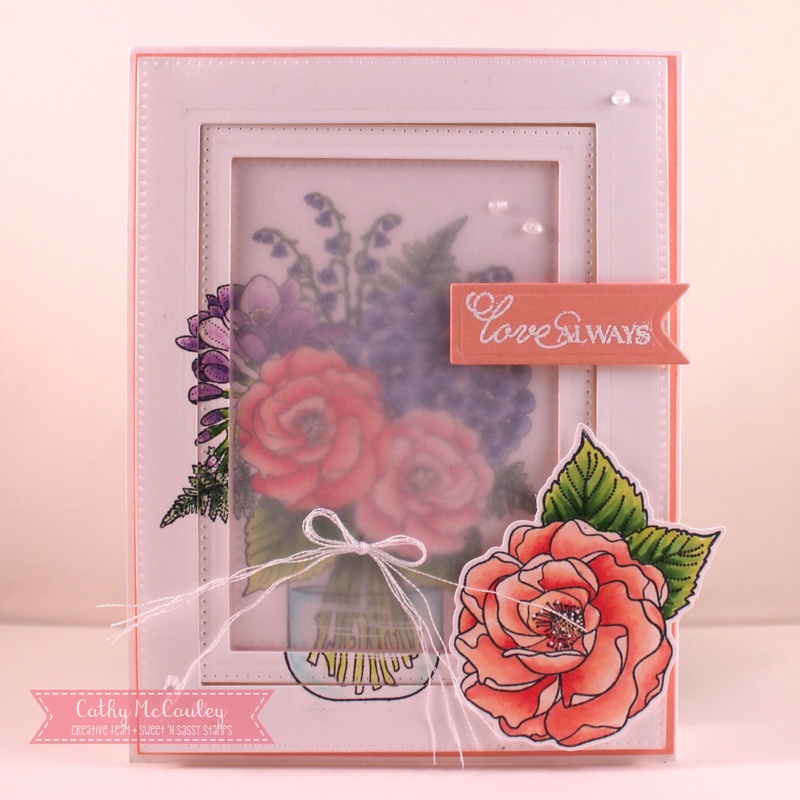 The new Mason Jar Bouquet set is so beautiful and so versatile - you can do a lot with it! After I colored my image with the watercolors, I went back and shaded some of the details with my Polychromos Color Pencils. This gives me the opportunity to worry a little less about the shading in the water coloring – and just have fun with it. AND it is fun! I hope you are inspired to try it! I love it! This image just makes me happy! Hello Sweet Friends! It's Monika here today with a simple but elegant card. I love using vellum. It adds an elegant and soft touch to your project. 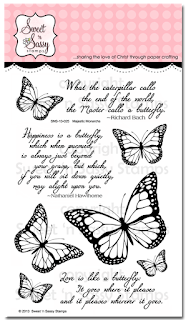 The butterfly (Majestic Monarchs clear stamp set) is heat embossed with white embossing powder on vellum, then fussy cut. If you happen to have the coordinating die (retired), it's even easier and faster to make this pretty number. 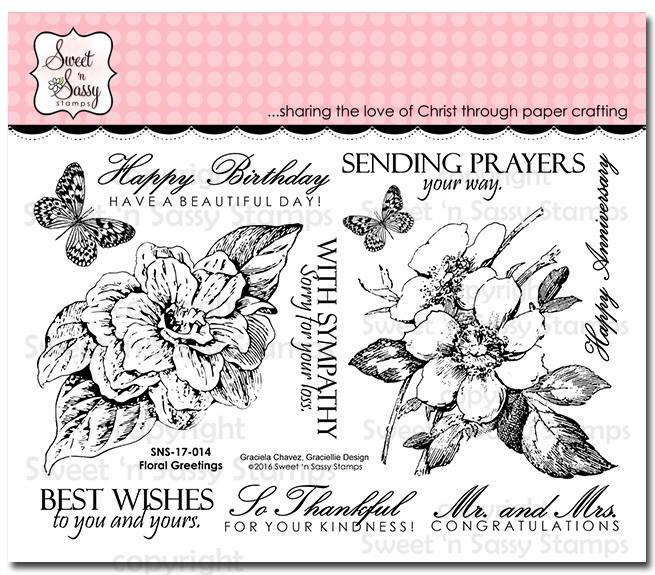 The background is stamped with the floral image from Floral Greetings clear stamp set. It adds a nice backdrop to the vellum image. I also spritzed the background lightly using my Spritzer Tool and a black marker. 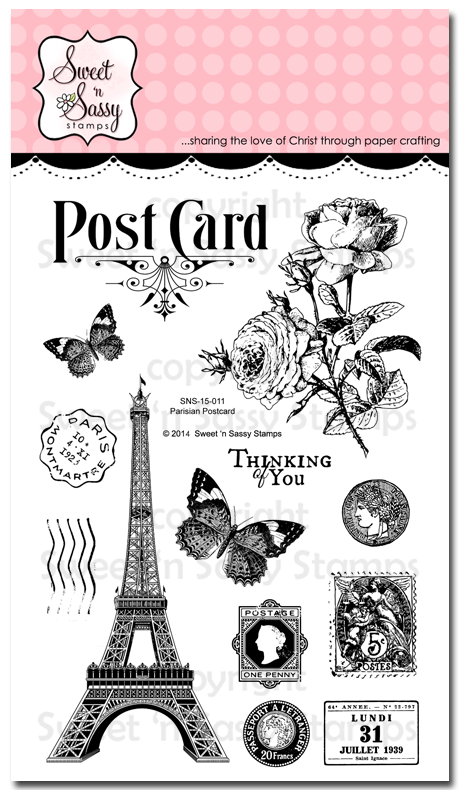 The simple greeting is from Keep in Touch, Too clear stamp set. I used washi tape, gold thread and gold rhinestones to embellish my 'simple' card. What more does a girl need? Right? I hope I inspired you to create something today!